There are things I really like about this pub, the food, the staff and the ambience but the ale lets it down. TT Landlord has been a permanent fixture since the pub's refurbishment and the other two beers do not rotate enough. I would visit more regularly if the ale was more varied. I think the pub is missing a trick, particularly since The Clifton closed sometime ago. Well kept beer, good food, and friendly staff. A perfect 'local', but well worth a visit from afar. Sometimes pretty quiet, but that can be nice. Even on quiet nights it's usually an interesting bunch of patrons. A good pub on its own terms, and far better than anything else around this part of town. Not too bad a refurb. Only the ubiquitous Adnams and Landlord on the ale front but they were both drinkable which is something in itself for a pub in NW6. Having read the good reports about the Sunday Roast, I visited yesterday with a group of five friends. I'd like to echo the positive reveiws already posted before. The roast served here is superb, friendly staff and the fact the pub was nearly empty adds to the relaxed atmosphere. I've given a high rating based purely on the Sunday afternoon/ meal experience. 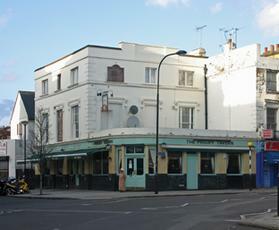 Knowing most of the pubs well in the area, this is my pick for Sundays.